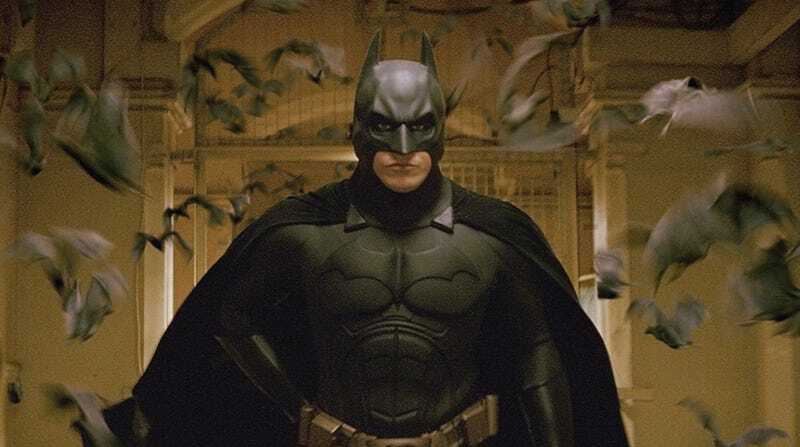 Neuroscientist and kinesiologist E. Paul Zehr has studied how a person might actually become Batman, looking at the physiology, training, and will that a person would need. And he told us how, even if you’ll never be ready for the Justice League, you can still become more like the Dark Knight. “I’m not trying to debunk superheroes… I’m just trying to give them a reality check,” Zehr told us in a phone interview. Zehr is a professor of kinesiology and neuroscience at the University of Victoria. He’s also the author of two books about the science of superheroes: Becoming Batman: The Possibility of a Superhero and Inventing Iron Man: The Possibility of a Human Machine. He’s also written a fiction book aimed at tweens, Project Superhero. Zehr has combined his scientific knowledge of the human body, rehabilitation, and martial arts to explore the possibility of real people accomplishing the physical feats that Batman does in the comics, TV shows, and movies. He shared with us what a person would need to do to become Batman, and what lessons we can all learn from the Batman stories. Zehr points out that there is a genetic component to how readily people build muscle mass. “If somebody has a myostatin gene deletion [myostatin is a protein that regulates the growth of muscle fibers], for example, or a set point on the myostatin expression that’s different from the normal population, they’ll get really big muscles really quickly.” Nature and nurture interact as we work to develop a wide range of physical skills. The biggest barrier to becoming Batman, according to Zehr, isn’t in your body; it’s in your mind. When Zehr gives talks on the possibility of becoming a superhero, he asks the audience, by a show of hands, whether they would like to be Batman or Batgirl or Batwoman. Roughly three-quarters of the attendees will raise their hands. Then he asks, “What if I said to you, how many of you would like to become Batman, where there’s a process involved and the process is a lot of work?” He outlines the time and training that it would take. Far fewer people raise their hands. So what are you spending those 15-18 years doing? Well, you’re going to want to be “an all-around athlete, the pinnacle of human performance.” So you’re going to want to develop a wide array of physical skills and abilities. There’s a very good reason for this. Zehr notes, “One issue is that some skills are actually counterproductive in the sense that they push our physiological systems in one direction and the kind of adaptation, the stress response you need from our bodies to do something else are actually in the opposite direction.” For example, Batman is going to need both the speed of a sprinter and the endurance of a distance runner. When you train for endurance, your body changes in certain ways—in your muscles, for example, or your cardiovascular system. The body needs to adapt in different ways when you train to achieve the strength of a sprinter. So if you want to become Batman, you’ll need to make sure you aren’t developing certain skills to the exclusion of others. Zehr also lists off a number of special types of training Batman would need: agility training, gymnastics or acrobatics, free running or parkour, and, of course, exposure to a variety of martial arts. Batman would need martial training in everything from projectile weapons (need to learn how to throw that batarang) to in-close ground fighting. “You can’t really say there’s some best-before date for trying to become Batman,” he says, but there is an ideal situation. “You’d have somebody training for something like this where they could dovetail that training on top of all the processes of maturation and development that are going on. We’ve got the best cocktail of things going on in your body for reaching maximum potential. That would be teenage years, basically.” Plus, if it’s going to take you more than a decade to become Batman, you want to make sure you’ve reached the necessary skill level by the time you’re in you mid-20s to early-30s. If, at this point, you’re thinking, “Screw it, I’m just going to become Iron Man instead,” Zehr has some bad news for you. Even if you’ve already got the suit, becoming Iron Man is going to require some major training. “It’s going to amplify your ability for sure,” he says, “but if your ability is terrible and you don’t have any skill, you’re going to make unskilled, very powerful movements. You actually have to have skill, training. You actually need to train for agility, martial arts… fidelity to move around in the suit.” He does believe that it would take far less time than training to become Batman, though—roughly five to eight years. But, Zehr argues, that doesn’t mean that we shouldn’t use Batman as an inspiration. There is always room for us as individuals to improve something, if we can commit to improving it. “It’s not about being that superhero. That’s not the point. The point is there are some aspects of any of those superheroes, for example Iron Man and Batman, there are some aspects that are true and real. And the key is, as soon as you realize that, it means that you can do more. So whatever you think is the maximum, whatever your job is and whatever the activity that you’re trying to do, here are some examples of people who do more and you can do more too. So the key thing is to draw down the real life lesson is that you can always do more. We’ve all got this bit of Batman inside of us that we can use to help us do better at what we’re doing.